Jack Davis Humbug #3 Cigar Store Indian, 1957 Splash Page Illustration Original Art (Humbug, 1957). In true "humor in a jugular vein" fashion, Jack Davis' macabre illustration takes a savage tomahawk chop at the folksy charm and lighthearted humor of that antiquated icon of smoking advertising, the cigar store Indian. Davis' line work on this hilarious illustration is magnificent. 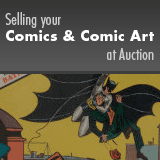 This piece has an image area of 8.25" x 12.5", and the art is in Excellent condition.